Each of these principles contributes to the overall success of your space. Today we will be focusing on contrast, which can be achieved through differences in color, form, and space. Color is a fun and easy way to bring contrast to a space. 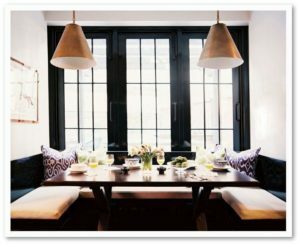 The black doors and trim below add sophistication as well as interest to the room through the use of contrast. Contrast can be provided through a paint’s sheen, as well as color. This gorgeous repurposed dresser by Kayla Payne is a great example of this. The high gloss shine of the Fine Paints of Europe in a Hollandlac Brilliant finish is in stark contrast to the lower sheen white shiplap wall behind it. The room below is an excellent study in contrast, in the way color and pattern are used. 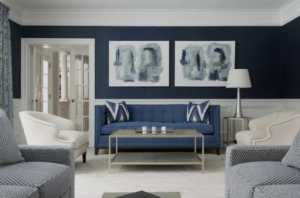 The grasscloth wallcovering provide a perfect backdrop to feature the artwork and accent the white trim in the room. If you are looking to add some contrast to your space, come see us at Columbia Paint or Clarksville Paint and Decorating Design Centers for one on one assistance. We are a Benjamin Moore Paint and Fine Paints of Europe dealer, and have over 300 wallcovering and fabric books. We also carry rugs, window coverings, and everything you need to paint your space. Stay tuned for next week’s design principle feature; We will be providing more tips and tricks to DIY your interior design.